After the "election". What next? Perhaps the biggest surprise of polling day was how much the Awami League government felt they had to rig the election on the day itself - since they had taken pretty extravagant steps to ensure victory before the vote itself. But clearly, the Awami League did not want to take anything for granted and used the police and their own activists to stop BNP supporters from voting, preventing opposition polling agents from entering polling centres, and stuffing ballots. There are enough eye-witnesses and reports to suggest that this was a widespread and systematic in most parts of the country. The plan set out in the documents leaked yesterday by BangladeshPolitico seemed to have been followed pretty assiduously. The Bangladesh opposition should perhaps counts itself lucky that the Awami League government allowed it to win 7 seats! The Bangladesh government will now get its ducks in a row - and we will hear similar utterances about the credibility of the elections from the local partisan election observers (who were permitted to monitor the elections by the Election Commission), from the Indian government, and other political allies inside and outside the country. The opposition has, understandably, rejected the election and has demanded a new one. It is, however, almost impossible to see how this could happen (at least in the short term) unless there was some kind of large-scale people's movement - which is itself highly improbable (opposition activists are now in hiding to escape arrest and are in no position to lead any street movement) and, were it to happen, would be ruthlessly repressed. So where does that leave the government. There is no doubt the government will survive - as it does have a significant support base - but its widespread and systematic election/vote rigging has arguably created a far greater crisis of legitimacy than it faced even after the uncontested 2014 election. The reason why the last elections were uncontested was because the opposition parties did not trust the Awami League government, whilst it held the levers of power, to hold a free and fair election. The opposition demanded that the election be run under the control of a neutral care-taker election-time government under which all elections since 1996 had been held. The AL government, however, argued that a special election time government was not necessary as it was quite capable of holding free and fair elections. The opposition refused to accept this and so boycotted the election. As a result over 150 parliamentary seats were uncontested, and the remaining ones were uncompetitive. 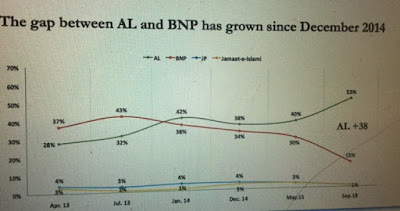 One of the reasons why the political opposition did not take part in these 2014 elections was to avoid providing legitimacy to a rigged process which they would have lost - at the time the BNP was ahead in the opinion polls. The BNP thought that if it did not take part, it could more easily attack the government for being illegitimate. To some extent the opposition was right. 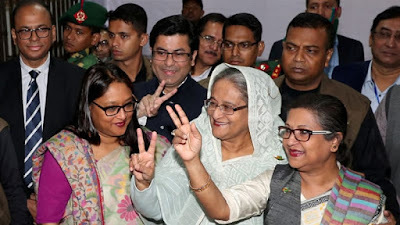 For some time after the 'elections', the government did have a significant legitimacy problem - however as time went on, the Awami League government managed to win over the international community, and was successful at repressing the domestic opposition. In addition, the government put forward the cogent argument that it could not be described as 'illegitimate' when it was opposition which refused to take part in the elections. 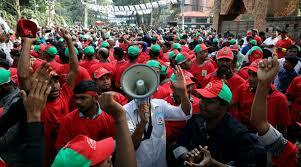 This time round, the opposition agreed take part in the election, despite significant reservations. In effect, it agreed to test out the government's notion that it would hold free and fair elections even though it was in power. And the government flunked this test, resoundingly. The government cannot now criticise the opposition for not taking part - and instead can only argue that the elections were free and fair. There will be a battle between two narratives - and of course with the government in almost total control of the TV news media, and partial control of the print media - it will trumpet these arguments hard. However, arguably, the government has gone too far in its rigging to make its arguments convincing. Apart from everything else, the very fact that the opposition won only seven seats will itself be seen as evidence of rigging. The Awami League government has dug a huge hole for itself from which it will emerge only with difficultly. The drip drip arguments about the lack of legitimacy in Bangladesh will take its toll, and whilst, the future of the country is not easy to predict, it may well lead in due course to more concerted demands, particularly from young people, for new free and fair elections that will be hard for the government to deny. - Dec 30: "Polling agents arrested" and "ballot boxes stuffed"
- Dec 27: Is it time to give the BNP opposition a chance? - Dec 11: Bangladesh's "Closing Democratic Space"
On the eve of the election, this blog reported on the the arrest of seven polling agents from one constituency, raising the possibility that preventing polling agents from entering polling stations could become a more systematic strategy of the Awami League government on the subsequent day. And this is exactly what has happened. The BNP claim that they had reports of polling agents being refused access in 221 constituencies. Having polling agents within polling stations is crucial to prevent all kinds of shenanigans happen within the centres including stuffing of ballot boxes, and improper counting of votes - which is of course why the Awami League focused their efforts in stopping opposition polling agents from entering centres. The Dhaka Tribune independently observed nearly 200 polling centres across the capital on Sunday, and hardly found any polling agents of the BNP and Oikya Front. The paper also reported on pro-Awami league people pretending to be opposition polling agents. The article is worth reading in full. The widely respected Zonayed Saki, chief coordinator of a small left wing party, the Ganosamhati Andolon, boycotted the elections in the three constituencies - one in Dhaka, Pabna and Chittagong - in which he and two other party candidates were contesting. According to him, their "poling agents were kicked out of polling stations and assaulted in almost every centre of Dhaka-12 constituency as well as in Chattogram and Pabna". It appears that many formal complaints have been made about this to the Election Commission (which will no doubt ignore them). The lawyer, Assaduzzaman, who was standing in Jhenaidah sent this complaint which not only deals with the polling agent issue but other conscerns about stuffing of ballot boxes and voter intimidation. 2. By 11 am of 30 December 2018, all my Polling Agents have been forced to go outside the polling centers under duress by the Awami league candidate’s agents and their fellow cadres encircled in the respective polling centers. That too happened in presence of the presiding officers and the member of the law enforcement agencies assigned therein who were either kept silent or had abetted their activities. The Awami league candidate’s cadres had stamped on the ballot papers in the open day light after ousting our Agents which have been seen by many people. Even some persons who died before 30 December have been seen to have casted their votes . These were the scenario of all the polling stations. 3. Immediately, I informed some of the incidents to the Assistant Returning Officer, Shailkupa over telephone but of no result. BNP supporters including my polling agents from all the centres had informed me over telephone that Awami League Candidate’s cadres had been resisting the voters on their way to polling centers, specially those who they believed to have BNP orientation. Motiur Rahman Bishwas of Baroipara has been caused leg broken injury and Md. Motiur Rahman Motin of Shailkupa Pourashova area has been caused grievous hurt with serious bleeding injuries while they were on their way back to Polling centres. 4. 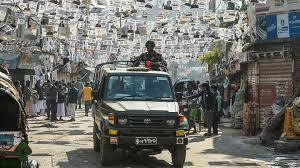 If any effective and fair due diligence is done, you will be posted with the facts that from 2 pm onwards of 29 December 2018, the Awamileague Candidate’s cadres had threatened from door to door of BNP supporters with dire consequences asking them not to go to polling centres and they have caused serious panic in the vicinity all over the Constituency and it continued the whole night. They also used abusive languages upon the female members of some of the BNP leaders and supporters. This horrific situation can never be said to be an atmosphere for holdin a free and fair election. 5. You may recall from your record that as many as 52 major incidents had been reported to you in writing over the last two weeks which were duly received by your office but no action had ever been taken in reference to those. Had there been any action taken against the perpetrators of those incidents, I strongly believe that the goons could have been controlled effectively and the election rigging could be prevented. Your failure to do the needful has not only given them a Frankenstein, but has also established your helplessness to conduct a free and fair election under a political government. 6. Please be noted that in the given facts and circumstances, this complaint could not be lodged before the respective presiding officers due to our no confidence upon them as their purported and biased inactions have fuelled the vote rigging. In addition to that , our Agents are apprehending that their life will be endanger if they go to submit it to the Presiding officers. Hence, making complain to the returning officers lacks effective and efficacious remedy. 7. In the circumstances, had there been a free and fair election, not only me but also the people of my Constituency strongly believe that I would be elected in a landslide victory. But the Awamileague Candidate has snatched my victory upon rigging the votes in the aforesaid manners. "Polling agents arrested" and "ballots box stuffing"
The next roll of the rigging dice now seems to be the police arresting opposition polling agents and ballot box stuffing - though it remains unclear how extensive this is. Polling agents should be able to play a crucial role in ensuring that some of the crasser attempts at vote rigging during the actual voting and the count do not take place. Removing opposition polling agents from the scene is a way to allow vote-stuffing and improper vote-counting - particularly when, as revealed by BangladeshPolitico, "Core AL Presiding Officers" have been allocated to certain polling stations. 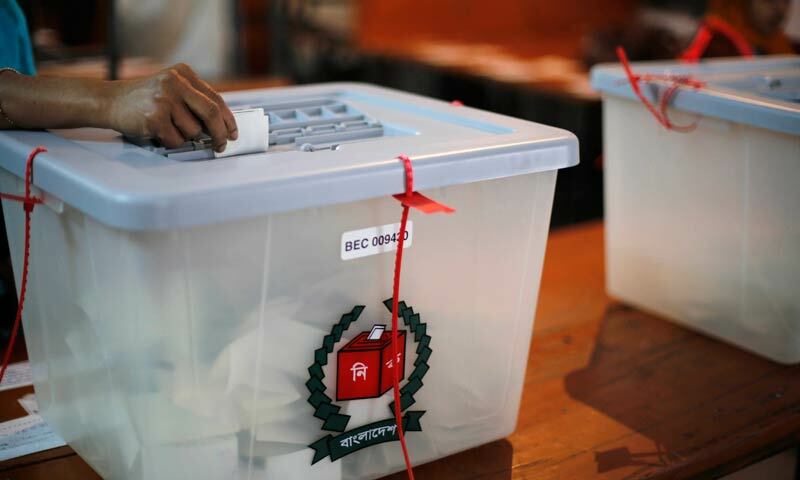 Local BNP activists in the constituency of Thakurgoan-1, where the opposition leader Mirza Fakhrul Islam Alamgir is contesting, have told BangladeshPolitico that at least seven of its polling agents, each attached to a separate polling centre, were arrested by the police on Saturday. As of writing, three of them remain detained, and the whereabouts of the other four are uncertain. 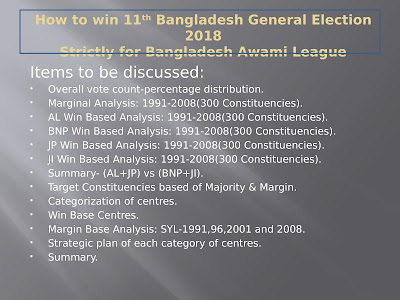 BangladeshPolitico has been sent a copy of a power point presentation that provides new information on what appears to be one part of the government's proposed strategy of rigging the vote. 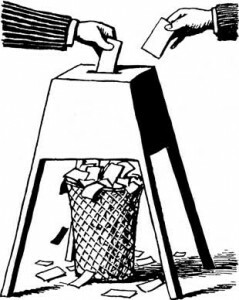 Read here more generally about pre-vote rigging. 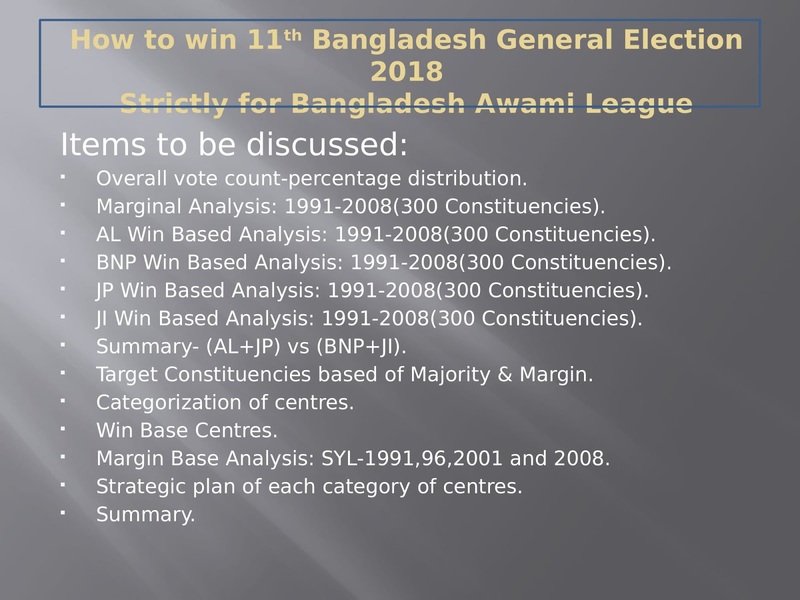 The presentation is titled: "How to win 11th Bangladesh General Election 2018: Strictly for Bangladesh Awami League." BangladeshPolitico obtained a copy of the document from a source in Police Headquarters. The information is contained in the final two slides of the presentation given to the Awami League government, probably before the formation of the National Unity Front, as it only refers to the BNP, and assumes an untroubled relationship with the Jatiya Party. Autocratic governments rig elections before any votes are cast - by restricting opposition candidates from standing, stopping the opposition activists from campaigning, and preventing opposition supporters from voting. All these we have seen in recent months in Bangladesh - through the government's control of the courts, the police and the election commission. These three bodies are no longer independent entities in Bangladesh, and have largely become part of the Awami League machine. The government would like to avoid having to stuff ballot boxes on the day - which makes vote rigging very obvious - so they are doing everything to deter opposition supporters from coming out on election day to vote. Is it time to give the BNP another chance? With my father-in-law, Dr Kamal Hossain deciding (surprisingly) a couple of months ago to lead the opposition alliance, I have kept away from writing professionally about this election and restricted my thoughts to this blog, focusing primarily on polls and the issue of the fairness of the election. However, I thought I should write at least one article considering the merits of the two competing party blocs. As I was writing this post, Anis Ahmed's op-ed for the New York Times, Bangladesh’s Choice: Authoritarianism or Extremism popped into my in-tray, so I shall set out my thoughts on the two party blocs through reviewing his article. In 2014, Bangladesh opposition parties boycotted the national election claiming that a vote taking place under the Awami League government - rather than a caretaker government* - would be rigged. The Awami League government at the time rejected that argument claiming that they could be trusted to hold a free and fair election. Without the participation of the opposition, the Awami League "won" the 2014 election. However, without a contested election, the Awami League government, particularly in the first few years after 2014, faced a serious legitimacy problem, both at home and abroad. Here was a government, many argued, that was only in power, on the back of uncontested elections. 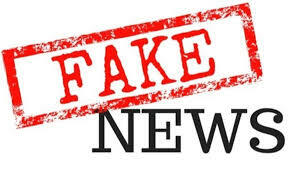 On the very same day that Facebook exposed the Bangladesh government over fake news, another of its websites, Banglainsider has published a totally fictional and defamatory story about me. And yesterday the website published yet another one. One can only wonder how desperate the Awami League government must be right now if it feels a need to get its hired hands to publish these kinds of stories which have no basis at all in fact. Bangladesh's Awami League government has been publishing fake news for years, but this week Facebook and Twitter exposed it for doing so. "Today we removed nine Facebook Pages and six Facebook accounts for engaging in coordinated inauthentic behavior on our platform in Bangladesh. Through our investigation, which began in part based on a tip from Graphika, a threat intelligence company that we work with, we discovered that these Pages were designed to look like independent news outlets and posted pro-government and anti-opposition content. Our investigation indicates that this activity is linked to individuals associated with the Bangladesh government." "The 51 constituencies were selected from a mathematical analysis of all national election results from 1991 to 2008. These 51 were the ones that switched parties the most or had the narrowest margins of victory on average. These were the constituencies that our party was most concerned with." 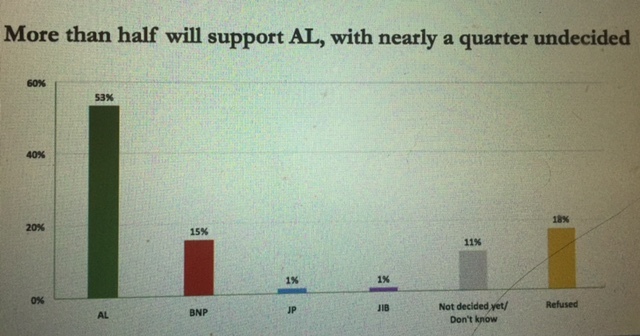 He goes onto say that, "The average AL vote is 66% to BNP's 19.9%, with an average 8.6% undecided." "On a party basis the Awami League leads in all 51, with the smallest lead 12.2% in Joypurhat-1 and the largest 75% in Barishal-4. 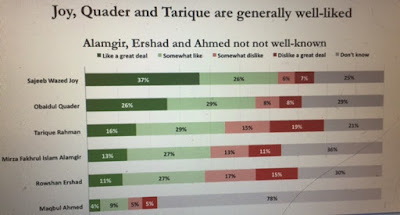 The smallest undecided vote is 2.5% in Tangail-3 where the AL lead is 41.5% and the largest is 19.8% in Shatkhira-3 where the AL lead is 64.7%, far above the undecided vote. This all seems very positive towards the Awami League. However, Joy is not telling the full story about these polls. At first glance, this is probably the most mystifying question of the current election campaign in Bangladesh. 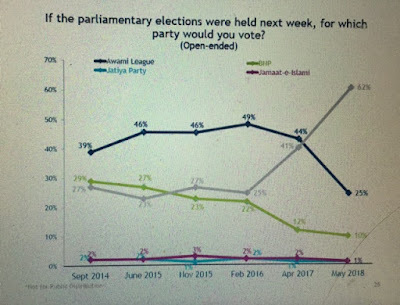 Whilst independent international opinion polls since May suggest that the Awami League is significantly more popular than the opposition Bangladesh Nationalist Party, the Awami League government is acting as though the only way it can win the election is to repress the opposition and steal the election? 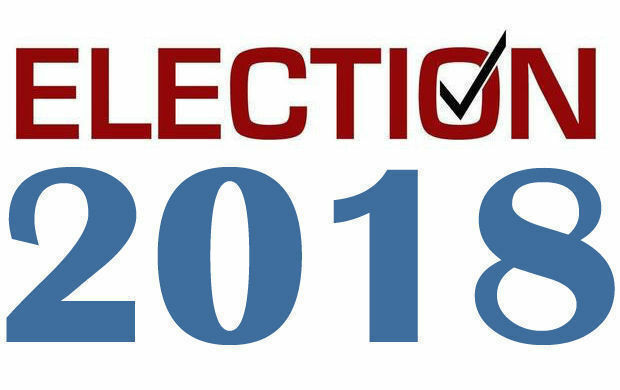 This blog has written a number of different posts on two opinion polls, undertaken in May and September 2018 by international organisations. However, you can read the whole of the unpublished opinion polls by downloading them here. The orthodox view amongst most independent political commentators in Bangladesh is that if there was a free and fair election, Awami League would lose. The commentators don't put this down to any great support for the opposition, but to a sense that there is a significant anti-incumbency factor, that people are fed up with the wide-spread corruption under the current government, the serious human rights violations including disappearances, extra judicial killings and arbitrary detention, the constant attacks on the opposition parties and the constriction on freedom of expression. The same commentators also argue that the Awami League will never allow this to happen - that the government will use its control of the political administration, the police and the election commission to ensure that they "win" the final results, manipulating the vote so that the opposition parties win a certain number of seats, but no more. Recent international standard polls, however, do not support the first part of this equation. Commentators may well be right in their criticisms of the Awami League government (as set out above), but these appear not to determine people's overall judgement of the government, and which party they will support in any election. The same commentators who think that AL is more unpopular in the country than the BNP are often the same people unwilling to believe in the credibility of opinion polls, however independent or competently undertaken they might be. An argument, these commentators often given is that Bangladeshis will not tell people how they are truly thinking, particularly when there is a repressive political environment where someone's support for the opposition can have serious negative repercussions, including arrest. They also argue that the Awami League's repressive activities against independent journalism and the political opposition is highly suggestive of a government fearful of losing the election. These commentators are of course right that there are real concerns about constrictions of freedom of speech and that many people will be scared to speak openly about their support for opposition parties - something identified by these very same polls and focus groups. However, at the same time, it is not clear that this reality would prevent the vast majority of people from speaking honestly in providing anonymous responses to a poll. 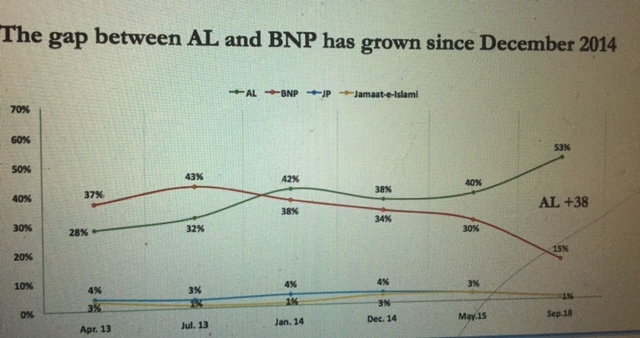 It is notable that before the 2014 election, these same polling organisations found that the BNP was more popular than the AL. As to why the government is so repressive in a situation where a free and fair election would likely provide them a victory - that is a more difficult question to answer, and I will come back to in a separate post. 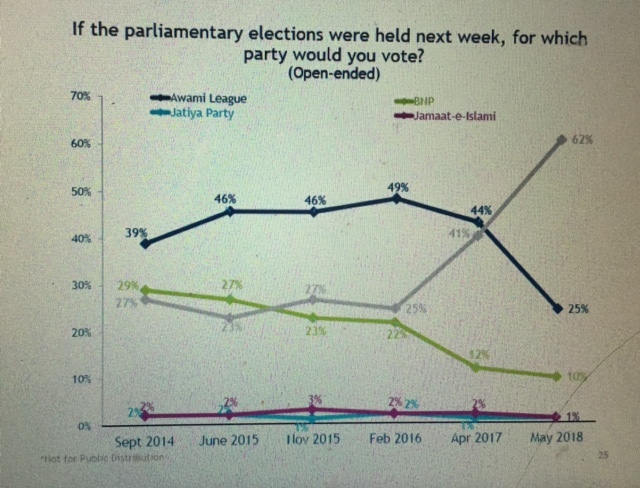 I have already written about what the IRI poll undertaken in May had to say about declining support for both the Awami League and the BNP, with the Awami League having 25% support compared to the BNP's 10% with 62% of people being undecided/refusing to provide a view. 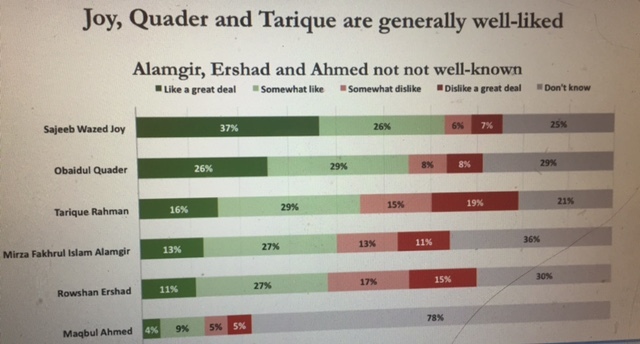 The more recent Democracy International poll however gives the Awami League a higher degree of support: 53% compared to the BNP's 15% - a 38% difference - with a much smaller number of undecideds. Even if, for arguments sake, one were to add the 18% who refused to say and the 15% who were undecided to the BNP's column this would only increase its total to 48%. Democracy International: Support for the parties since 2012. In what direction is the country headed? IRI May 2018 poll: Right or Wrong direction? This support for the AL is also reflected in responses to the question in the about whether the country is going in the right/ wrong direction - 70% (in the right direction) to 17% (in the wrong direction). 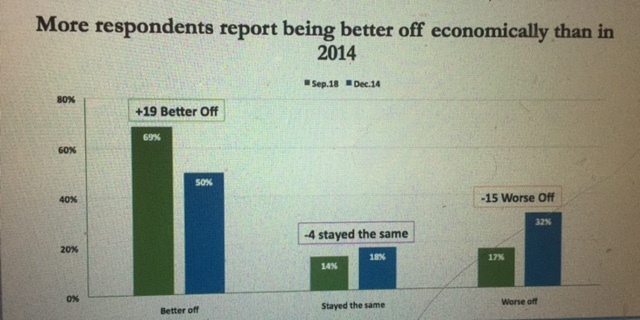 Democracy International, Sept 2018: People who report being better off? The main reason given in both polls why people believe the country is heading in the right direction is their view that the economy is improving, which is also reflected in that most people state that they are better off economically now than they were five years ago. When asked, "Are you (personally) better off than you were five years ago, are you not better off or about the same? ", 69% said that they felt better-off and 13% said that they were worse-off. 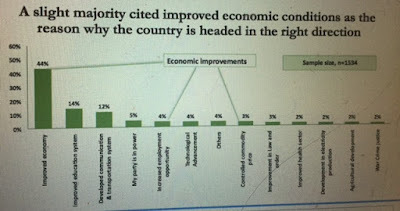 The Democracy International poll also shows that people have much more confidence in the Awami League's ability to deal with the issues important to people. For example, 72% of people think that the AL is better able to address improvements than infrastructure whilst only 12% thought that the BNP were better suited. 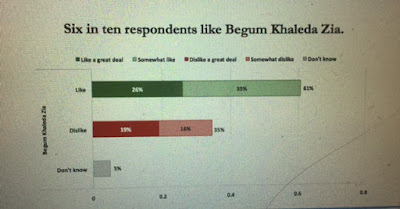 The Democracy International poll also found that AL leaders, in particular Sheikh Hasina are well liked people, and more liked than BNP leaders. However, BNP leaders are also quite popular. Please email me here with any new information or comments. 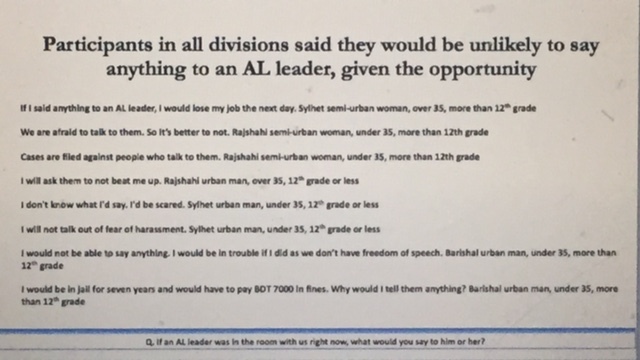 "If an AL leader was in the room with us right now, what would you say to him or her? "Participants in all divisions said they would be unlikely to say anything to an AL leader, given the opportunity." 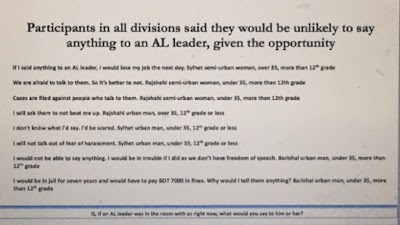 "In one of the most riveting exercises of the groups, at the very end, the moderator asked participants what they would say to a leader of AL and a leader of BNP, if they were sitting in the room. Participants in all divisions, men and women, urban and rural (though more urban than rural) said they would not even consider doing so to a leader of the ruling party, out of fear of retribution. A few offered policy suggestions or mild criticism but most would not." 2018 election: "Bangladesh's closing democratic space"
You wait ages for a bus, and then they all come at once! I thought that the International Republican International (IRI) poll undertaken in May 2018 was the most recent international standard poll undertaken in Bangladesh, but I was wrong. 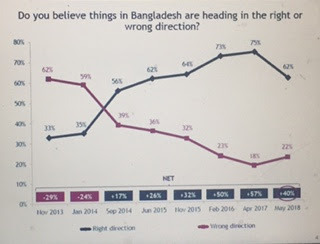 Democracy International/Nielsen Bangladesh undertook a more recent poll in September 2018, along with focus groups a few weeks later in September/October - and a source has sent the results report to BangladeshPolitico. 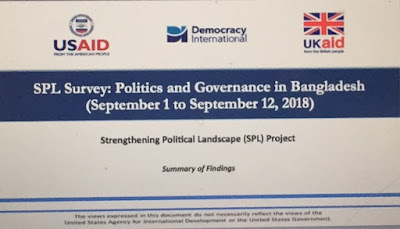 In recent years, only one organisation has undertaken international standard opinion polls in Bangladesh - and that is the International Republican Institute (IRI). They, in effect, took over the role from Democracy International which undertook hiqh quality polling before and immediately after the 2014 election. Since May 2014, IRI have conducted a total of six opinion polls, with the most recent one being in May 2018. After each poll, they have published a public version of the results, some months later, with the results of the May 2018 poll (involving 5000 respondents, representative of the population) made available in September 2018. "If the parliamentary elections were held next week, for which party would you vote?" 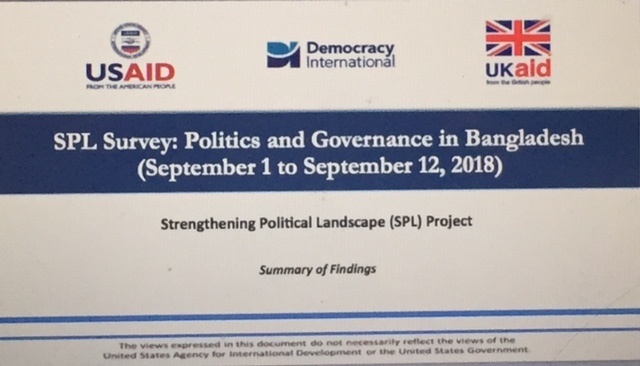 BangladeshPolitico has however now obtained a copy of the results to this question (the slide states at the bottom: "Not for public distribution") involving all the six IRI polls undertaken since 2004. 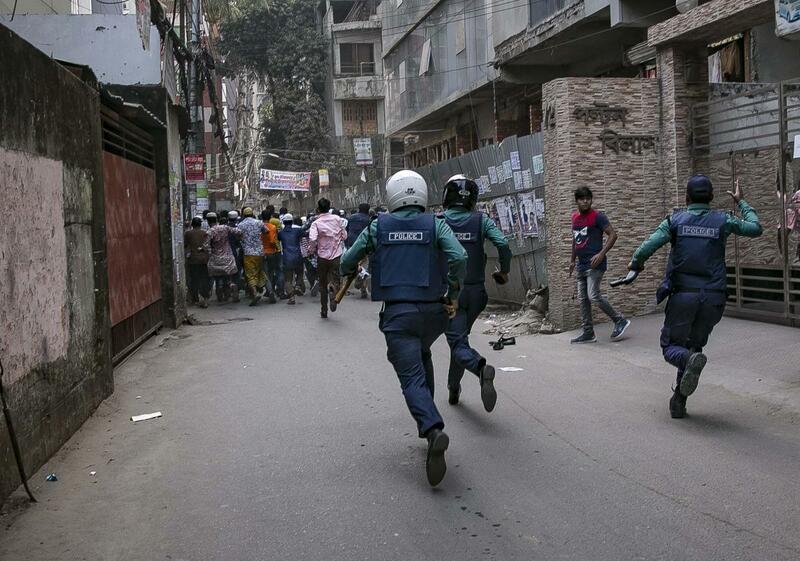 Five years ago, just before the 2014 elections, Bangladesh law enforcement authorities picked up 21 Dhaka-based activists belonging to the Bangladesh Nationalist Party in seven separate incidents over a two week period in front of witnesses. Each of the pick-ups, which took place between November 28, and December 11, 2013 were investigated by The New Age newspaper and were subsequently written up in further detail in a report published by Human Rights Watch. Five years ago, I was working as a journalist in Bangladesh employed by The New Age, one of the country's leading English language national newspapers, as well as writing on this blog about the forthcoming January 2014 elections. I would still be in Bangladesh now, writing about the up and coming election later this month, if last year the government had not, after 13 years of living in the country, forced me to leave. I heard from senior government sources at the time that retired Major General Tareq Siddiq, the defence and security advisor to the prime minister, was behind the decision - no doubt annoyed by articles at that time on disappearances, political corruption and much more. Soon after I left the country in July 2017, the Bangladesh government sent a circular around to all its embassies ordering that they should refuse any future visa applications I might make. So much for journalistic freedom in Bangladesh. Sajeeb Wazed Joy is the son of Bangladesh’s prime minister, Sheikh Hasina, one of her mother’s official advisers and, apparently, the governing party’s chief propagandist. Many of his articles and Facebook posts are full of falsehoods, lies and misrepresentations – see here about disappearances, here about a plot to kill him, and here about corruption. This week in a highly offensive, inaccurate, defamatory and anti-semitic post he has taken aim at my father-in-law, Kamal Hossain, a well known lawyer and personality in Bangladesh who has decided to take a step forward into the political mainstream (and maelstrom) by allying his party with the country’s main opposition party, the Bangladesh Nationalist Party, with a series of demands around a fair election, and proposals to improve governance. The Bangladesh government has blocked The Wire.in so for those in Bangladesh who cannot access the news website, I am setting out below my recent article on Tulip Siddiq MP, the niece of the Bangladesh prime minister and what her role should be in calling out human rights abuses in Bangladesh. The original article is here. What Can Tulip Siddiq Do to Lessen Human Rights Abuse in Bangladesh? With her aunt Bangladesh Prime minister Sheikh Hasina in London, the question of Siddiq’s role in seeking to mitigate Bangladesh’s worst human rights abuses comes to the fore again. Dhaka: Bangladesh Prime Minister Sheikh Hasina arrived in London late Friday on her way to New York to take part in next week’s United Nations General Assembly. According to press reports, she will stay in the capital for a few days – in Claridges no less – and meet party activists as well as members of her own family. Hasina has two main family members in London. Her younger sister, Sheikh Rehana and her niece, the British Member of Parliament Tulip Siddiq. In November 2016, Private Eye first reported that whilst Tulip Siddiq had been campaigning hard for the release of her constituent, the Iranian-British dual citizen Nazanin Zaghari Ratcliffe, from detention in Iran, she had not lifted a finger in relation to those picked up and literally made to disappear by government agencies in Bangladesh. Channel 4 News picked the story a year later when its reporters directly asked the question about why the Member of Parliament for Hampstead and Kilburn had refused to use her influence to help the family of a particular disappeared lawyer in Bangladesh, Ahmed Bin Quasem, whose mother had written directly to Siddiq asking for her help. 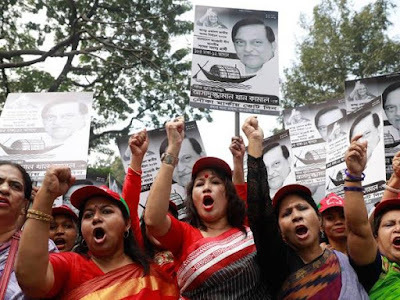 Now, with her aunt – and Bangladesh’s prime minister – in London, again, the question of Siddiq’s role in seeking to mitigate Bangladesh’s worst human rights abuses comes to the fore. Of course, it is not just Siddiq’s maternal aunt who has significant political power in the country. Her paternal uncle, Tarique Ahmed Siddique is the defence and security adviser to Hasina. 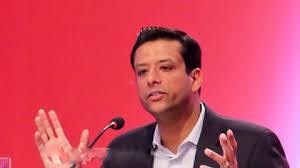 Her cousin (the son of the prime minister) Sajeeb Wazed Joy, is another government adviser as well as being a key propagandist of the government. Her brother Rezwan Siddiq helps run a pro-government research centre; and her mother, Rehana Siddiq, is also a player within the party. And Siddiq’s mother, cousin and brother are all talked about as possible successors to Hasina to lead the Awami League, the party in power in Bangladesh. 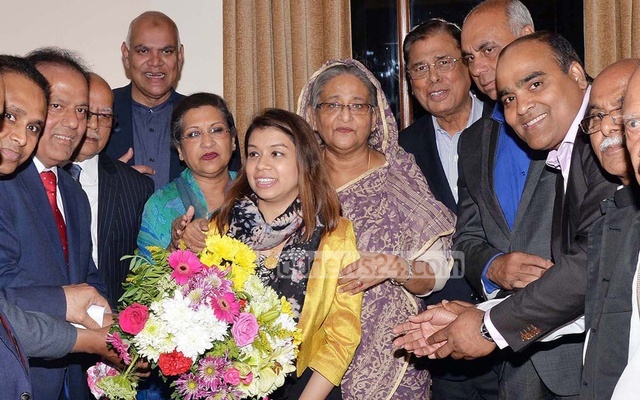 Moreover, Tulip Siddiq is also very close to her aunt Sheikh Hasina, calling her a ‘role model’ for her daughter. When she first won her North London seat in 2015 the newly elected MP said, “Today I remember my Auntie Sheikh Hasina. I learnt how to campaign from her. And I learnt about social justice from her.” When she made her maiden speech in Parliament, who other than Sheikh Hasina was present. Although she lives in Britain, Tulip has been directly involved in Bangladesh politics. As a Labour party activist, before she became an MP, Tulip described herself on her website (now removed) as an “Awami League spokesperson” and campaigned in Bangladesh for the party. In 2011, she was listed as a delegate of the Bangladesh government at the 66th UN general assembly alongside her mother Rehana Siddiq. Tulip Siddiq’s close proximity to those ruling Bangladesh is therefore undeniable and is therefore unique amongst the 650 UK MPs in having such close and intimate relations to a ruling party of another country. 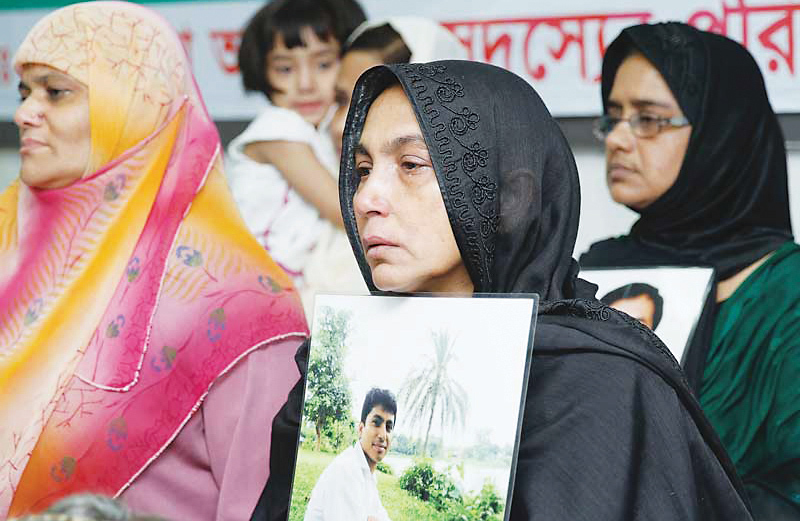 The question of course – one which no other Member of Parliament has to face – is whether or not Siddiq, as a British member of parliament, should be using this proximity to lobby publicly and privately, with her aunt and other members of her family in Bangladesh, significant human rights abuses in the country? She also implied that those who sought to argue that she did were racist. “Be very careful. I’m not Bangladeshi,” she told Channel 4 News when they tried to interview her at a rally. She then went on to make a police complaint arguing that she was subject to “racially aggravated assault” by the television news team. It is of course the case that Quasem’s mother was neither a British citizen nor Tulip Siddiq’s constituent and the MP therefore had no parliamentary obligation to take up his case. But that did not remove her moral obligation as a British member of parliament to use her best efforts to seek his release. Those who do not know Bangladesh politics may not appreciate the extraordinary influence Siddiq, as a member of the ruling family, can wield in Bangladesh politics. All the country’s institutions, particularly the law enforcement agencies and the criminal justice system, are corrupt and highly politicised. In the main, they do exactly what their political masters tell them to do. And the most significant of those political masters are members of the current ruling family – of which Tulip is a part. Channel Four News came back to the issue of Bangladesh’s human rights situation in April 2017, in a film about a number of other disappearances in Bangladesh involving this time British families, who had written to her about their relatives. This was a private communication – not a public condemnation of Bangladesh human rights – but it was a step beyond her previously maintained silence on the human rights situation in the country. However – unlike the other two Bangladesh origin MPs – she has not issued a public statement as they have done. She has also not as far as anyone knows, lobbied her aunt and other family members to ensure his release. And neither has she sought the release of any of the dozens of other men who have disappeared in the country. With her aunt in London for a few days, this is an ideal opportunity for Siddiq to take her Aunt to one side and push for the release of all those disappeared and arbitrarily detained. Ironically, though Tulip Siddiq is representing those living in her North London constituency, as an MP she could do far more good through her influence over her family members that rule Bangladesh, than she will ever do for her constituents in Kilburn and Hampstead. As a former employee of Amnesty International she should appreciate the position provided to her as a Member of Parliament and use it for the public good to help those victimised by Bangladesh’s state agencies. And she would be applauded if only she would do that. "The PM's son, Deceit and the Case against Shahidul Alam"
The Bangladesh government has blocked the Indian news website Wire.in and as a result its articles can not be read in the country. Below therefore is the text of a recent article, written by The Wire about an intervention made by Sajeeb Wazed Joy, the son of the Bangladesh prime minister, seeking to justify the detention of the photographer, Shahidul Alam, titled, "Sheikh Hasina's Son Has Exposed the Deceit in the Case Against Shahidul Alam". The original article is here. Sajeeb Wazed Joy's Facebook post on the photographer's arrest is full of falsehood, misrepresentations and faulty analysis. Sajeeb Wazed Joy, the Bangladesh prime minister’s son as well as her adviser, has intervened in the debate on the detention of Shahidul Alam, the eminent and internationally regarded photographer picked up on Sunday and now remanded to police custody, arguing in a Facebook post – and widely reported in Bangladesh media – that Alam had published false posts which directly incited violence leading to the blinding and crippling of one Awami League activist. 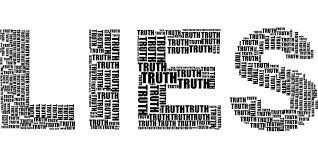 It is a scary intervention since in Bangladesh, to those working within the administration, law enforcement and justice system, pronouncements by the ruling family are like edicts from god on high. It is difficult to see now how any police officer, magistrate (or even some judges) will dare to actually engage their independent minds to the facts of the case. Apart from being scary for its implications on Alam, it is also scary because Joy’s Facebook post is full of falsehood, misrepresentations and faulty analysis. One should not be surprised at this. In the recent past, he has falsely argued that disappearances don’t take place in Bangladesh; that a Canadian court exonerated the Bangladesh government from corruption in a World Bank-funded project and that the journalist Shafique Rehman was involved in a plot to kill him. So this is par-for-the-course. This blog has already written how the police significantly distorted its First Information Report written against Shahidul Alam - which sets out the rationale for his detention - claiming that he had stated sentences which he had never said, in fact just inventing sentences out of the air. However, with the assistance of the journalist Tasneem Khalil, this blog can now set out more distortions in this FIR.